Mini pancakes is their specialty, and it's not just that the dough is so mouth-watering and fluffy as ever, the plate also shows you the best of all the worlds. Situated on Asha Taghlib road, Maison de Zaid boasts of homey vibes and princely hospitality, you'll feel like you're right at home. One of the heartiest meals you'll have in Jeddah, Mugg And Bean gives you the English breakfast just like it's supposed to be. But if you want to be able to move around after the food, they have other lighter options that include oatmeal and fruits. You'll find this spot on King Abdulaziz Service road. 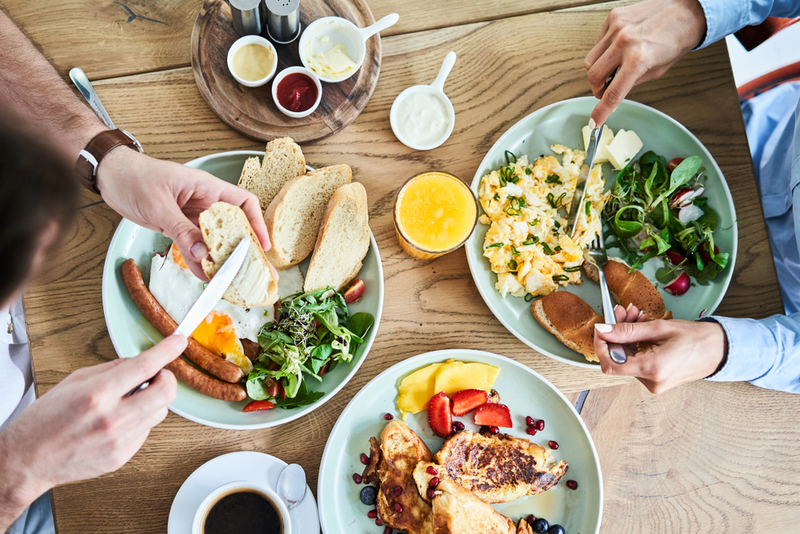 French toast, croissant, and scrambled eggs; this quaint restaurant will have you coming back for more and more each time. The renowned Belgian chocolatier branch, located on Prince Sultan road, specializes in breakfast, chocolate making, and desserts, and is you go-to for all European delicacies, including brunch. Bon appétit! Calling all the eggs benedict fans! Just off Prince Faisal bin Fahd road, Amara Cafe and Restaurant makes one of the best Eggs Benedict plates in Jeddah. Just imagine that Hollandaise sauce dripping over the soft poached eggs, and while that tantalizing bite hits your taste buds, you'll be sitting and enjoying a lovely view from their terrace. Also, their breakfast menu is extensive, so we recommend the you try their salmon avocado toast as well. This spot is great at making - well, you already guessed it - sandwiches. Located in Prince Saud Al Faisal road, The Sandwich Gallery serves sandwiches hailing from all over the world, and they guarantee their unmatched quality, variety, and juiciness. Our favorite item on the menu is the shakshoka on bread, which is made of eggs poached in a sauce of tomatoes, and garnished with cumin, paprika, cayenne pepper, and nutmeg, all wrapped up in a sandwich. Who's in the mood for mankoushe, foul, and halloumi? This Lebanese restaurant is known for making homemade recipes, and mutiple course feasts. Part of a 20-restaurant food chain around the Middle East, Leila's knows how to serve you a Middle Eastern breakfast like no other. You'll find the place on Prince Saud Al Faisal road, and word of mouth says that it's the best Lebanese cuisine in Jeddah. Your basic waffles and french toast but topped with sensational exploding flavors, like this French toast special coated with berries and ice cream with a sabayon glaze. Brew92 is located on Prince Saud Al Faisal road, and you better hurry there first thing this weekend to enjoy the darkly-roasted coffee with a side of their specialty pancakes.